A few weeks ago, a friend posted a “#carselfie” to Instagram. It was a beautiful photo -- she peered up at the camera from under a beanie and looked positively radiant in the passenger seat of her car -- and I duly “liked” it. “#Toogorgeous,” another friend wrote in a comment under the photo. She’s a stunning lady. But the photo, I learned later, was in fact “#toogorgeous” to be true: She’d had some digital work done. My friend, like millions of others online, had spruced up her selfie with Perfect365, a free app that lets people instantly smooth skin, excise zits, highlight eyes and even resize noses before sending their image out on the Internet. Perfect365 belongs to a growing breed of selfie-help apps, like FaceTune, ModiFace, Pixtr and Visage Lab, that let anyone with fingers and a smartphone transform basic snapshots into flawless Annie Leibovitz portraits (Buzzfeed’s John Herrman dubs this “selfie surgery.”) Eyelashes can be added, teeth whitened, smiles stretched, pounds shed, clocks reversed, genes fought. And artfully, too: unlike the previous generation of portrait-editing apps, which left figures with the two-dimensional masks of anime characters, these apps, like the best plastic surgeon, leave few obvious marks. I, for one, would never have guessed the #carselfie had a little help. Perfect365 in action. 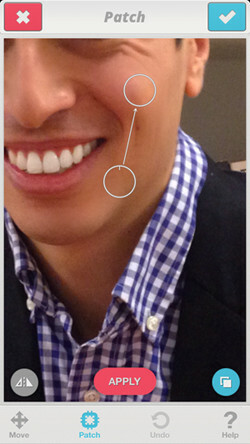 Users must first align their face with "KeyPoints," then can choose a range of effects, from adding false eyelashes and sweeping on blush to evening out skintones and whitening teeth. While many claim social media has provided a more authentic and unvarnished view into people’s lives, the popularity of these selfie-help apps suggests precisely the opposite. We’ve always cherry-picked what we share online, but more than ever, what you see isn’t what you get. Even as people use Snapchat to share silly photos that, crucially, disappear after a few seconds, those same social media users are delighting in new ways to edit their lives and present an ever-more perfected, artificial image of their world. We’re hungry for ways to exert more control over our images, not less. And who’s to blame us? The rise of selfie-help represents a new way for people to cope with the relentless judgment of the web and the pressure to disclose more online. It also hints at the start of an airbrushing arms race that could make impossibly attractive photos the norm. 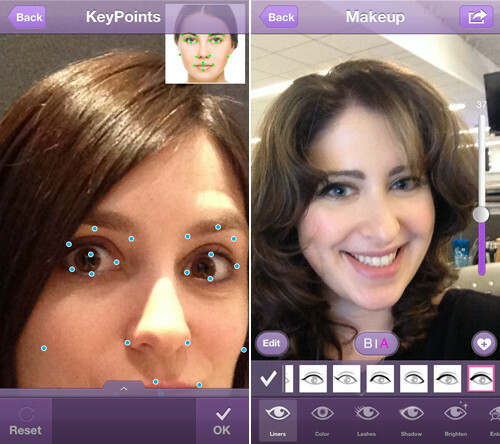 While selfies have lost their stigma, these selfie-help apps are still taboo. Just 50,000 Instagram photos have been tagged #Perfect365 -- mostly people playing with the app's makeup filters for dramatic effect -- but the app has been downloaded 17 million times since its launch two years ago. People’s reluctance to acknowledge the handiwork of their digital dermatologists hasn’t much hampered the success of this type of app: ModiFace’s suite of about 20 editing apps have been installed nearly 27 million times, and FaceTune, since its debut this past March, has topped Apple’s rankings as the most popular paid app in 69 countries, including the U.S. These selfie-enhancers skew toward teens and 20-somethings, who are highly active on social media, and are also overwhelmingly female. Seventy percent of the users of FaceTune, which its creators, perhaps naively, thought was “gender neutral,” are female. And two-thirds of Perfect365’s users are under 24 years old. The pictures end up on dating profiles, Instagram, Facebook or even Christmas cards. (The chief executive of ModiFace said there’s always a bump in downloads around the holidays.) An 18-year-old high-school student in New York, who declined to be named to protect her privacy and her friends’, said that nine out of ten female friends quietly edit their Facebook profile photos before they’re uploaded, sometimes making an arm look skinnier or blurring a double chin, other times just tweaking the lighting to make it more flattering. “I’ve had phone calls where girls will ask me to go on iChat and send me four different versions of the same picture -- with different lighting, with different skin," she said. Among her peers, iPhoto’s suite of tools is still the most popular, she said. FaceTune's "Patch" tool in action. Though Perfect365 offers a range of dramatic makeup styles, with names like “Enchant,” or “Ocean,” the app’s most natural-looking filter, which gently evens skin tones, is the most popular. (According to ArcSoft, 80 percent of people either use the "Natural" filter or custom settings.) The co-creator of FaceTune, Nir Pochter, agreed that most of their users opt for only minor improvements, like whiter teeth or fewer pimples, that don’t reveal any futzing with the photo. “My impression from our users is that they want to look in all their photos how they know they can look, because they saw it in their best photos,” he said. Jacqui Adkins, a 29-year-old FaceTune fan from South Amherst, Ohio, recently used the app to spruce up a shot of herself and her 7-year-old son. She touched up her skin, covered up a scratch on her son’s chin and then made the picture her Facebook profile photo. The appeal, she said, was that she could subtly fix temporary flaws caused by a breakout or poor lighting. So may everyone else. Even with a small fraction of Facebook and Instagram’s users currently morphing their photos, it’s clear these apps have the potential to make touching up de rigueur, so that every casual snapshot has the polish of a Vogue photo shoot. Sebastian Thrun, the co-founder of Google X, told me in an interview last year that he imagined technology like Google Glass, with its ever-present camera, could push us to share photos that are “uglier” and “more personal.” Instead, a contradictory trend is in motion: our pictures are getting prettier. These apps are attractive for the simple reason that they work. To be fair, I fall precisely in these apps’ prime demographics -- 20-something, female, active online. Yet I’ve found myself drawn to them much more quickly than I’d have liked, in large part because my pictures really do look better. And every other photo looks worse. After browsing the FaceTune-tweaked portraits on Instagram, and editing a few of my own, I’m horrified to see the photos I’ve shared on Facebook in the past. I have blotchy skin in one picture, and I’m too pale in another. Red eyes! Too-yellow teeth! The selfie-enhancers set a new baseline for photo perfection, and unlike Instagram filters, the face fixing happens covertly, without any acknowledgment of the divine digital intervention. 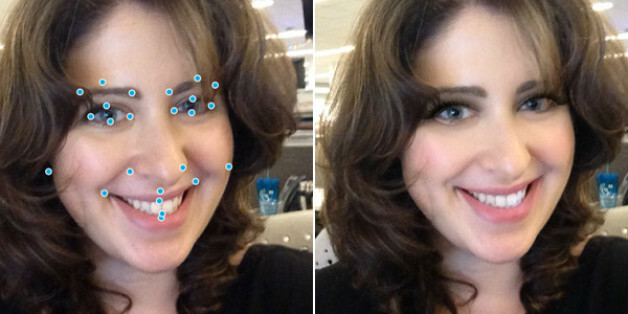 In the images where the selfie-enhancement isn’t done so carefully, and the cheek is just a tad off or smile a bit over-stretched, you learn more about a person than an unaltered photo ever could have revealed, and more than they’d ever want to admit on social media: In our effort to fix everything, we reveal what isn’t going right. The HuffPostTech team, "perfected" with Pixtr. This story appears in Issue 80 of our weekly iPad magazine, Huffington, available Friday, Dec. 20in the iTunes App store.